I am going through some book reviews on Amazon for the Paralegal's Journal and thought a blog post was in order to address the indexing system and show some photos of how I use the Paralegal's Journal and how my work tends to flow daily from my Top 3 Work Tasks. Also, I have made digital download versions available on the site for those of you who wish to print the content and assemble your own spiral-bound books. 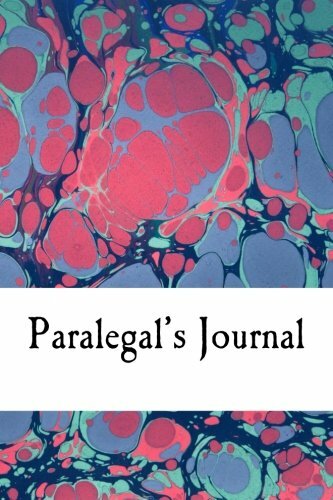 What are the blank lines in the front of the Paralegal's Journal? The blank lines that begin with "13" within the Paralegal's Journal represent an indexing system that will aid you in reflection and planning throughout the year, and keep you organized if you have to find something important later. The reason the lines begin with "13" and not "1" is because the Paralegal's Journal is designed as a book journal, and like a traditional book, the contents do not begin on Page 1! Pages 181 - 200 of the Paralegal's Journal have already been pre-indexed for you with topics of: Major Projects - Goals Achieved (January - December); Continuing Education; Networking / Associations; Vendors; and Contacts. Quite frankly, utilizing these topics is what really makes this journal so much more than just a to-do list! This is a book of your life. You probably spend more hours at work than you do on anything else besides sleeping/grooming/eating/driving. Write it down and make it memorable. Make it count! Here is a picture of the first content page, which you will see begins on Page 13. Just a typical day in the life of a personal injury litigation paralegal! My Top 3 Work Tasks were set as a discovery call; updating a medical chronology; and drafting a deposition summary of a client. From those tasks, you can see how my work flowed down to other tasks that generated from the first source project. For the discovery call, I had a new "Documents to Obtain" task: get the client's surgery photos and the Verification to serve with the Interrogatory responses. From the medical chronology update, I found out from reading a visit note to the Orthopedist that the client had an MRI that she didn't tell us about, so I made an entry about obtaining these new records and bills. I also made a note about asking our records clerk to request these new records and bills. Since the work day left me with open items, I used a "To Do" post-it tab to alert me of open items that I would need to go back to. I would then index this entry only with the date because there is nothing majorly important about this "typical" work day that I feel I need to remember later. For days where I have done something out of the ordinary, or helped someone in some way other than just ghosting their demand letter or drafting discovery, I would index that particular event. If there was a deposition, or a hearing I attended, I would index that. So I think of indexing in a manner of noting events or memorable wins. Otherwise, I just use the date for the index entry. Why Are You Even Keeping a Work Journal? Isn't it a Waste of Time to Use This in Addition to My Firm's Software? Keeping a work journal is not for everyone. I know the idea will likely overwhelm many. Some do not see the point since they manage tasks electronically with their firm's software, and may see this as overkill or a waste of their time (luckily, none of my reviewers have said that - so thank you!). Like any journaling, a big reason that I do it is because it makes me happy to have records that prove I didn't waste my work day. Also, I am very, very serious about my work, and I am very, very serious about tracking my achievements and documenting my wins. I would never use another person's software to document my life. What happens if you leave the firm? Are they going to let you retroactively assemble your life? No, of course not. Not just that though. This is your life. Your achievements are yours to prove. If you don't keep track of them in real-time, they are likely going to be lost to you. For those of you working in law firms who either have to go through the annual review process, or want to insert yourself in a review process to ask for a raise, don't you think your boss is going to be more likely to approve your request when you slap this book down and say: "Look what I've done for you this year. Let's look at January. Oh, yes, I can see that I authored ten policy limits demands for you and eight out of ten times limits were turned over. I believe that meant you only had to spend about 30 minutes reviewing my draft demands, but they were otherwise just as though you had written them yourself? Does that sound right to you? Excellent. Let's turn to February. It says here that I subpoenaed and then reviewed the prior driver's files of Harden for the Jackson trucking case and then extracted the hot docs that proved the trucker lied on his current job's application and that the company we sued failed to conduct pre-employment background checks for the negligent trucker. All you had to do was show up an hour early before the deposition and go through these hot docs? Do you remember that? I know, that was a good case, right?! Okay, March. Oh, you've heard enough now? You want to just approve my raise? That's great. I've got stuff I've got to get back to too now. Catch you on the flip! And you know I'll call the accountant directly if that raise doesn't show up on my next direct deposit, so you better go on and get on the horn." Besides collecting evidence of your super paralegal powers, I would suggest using the journal to keep yourself positive. The legal field is a tough business. If I am having a tough time at work, I will try to be aware of noting positive things so I don't get to that point of wanting to throw my hands up and walk away. Did I help someone today? How? What was the point of my entire day? Let's face it, being a paralegal is often a thankless job. To be successful and happy, you will often have to motivate yourself. I've found that journaling keeps me positive and focused. It allows me to have a record that I did not waste today. My objective today was not "survive this day." My objectives were accomplished. Today, I had a purpose. Did you? Do the work. Document the work. Be happier. Make a lot more money. It worked for me.